Vamos falar um pouco de Aquarela? 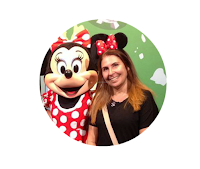 As fotos e o vídeo de hoje mostram como fazer uma cartela com apenas 2 cores de aquarela (e quando digo aquarela também poderia dizer guache) e o resultado da mistura dessas 2 cores. Quando compramos uma caixa de aquarela nem sempre fazemos um estudo detalhado de cada cor, ou quando fazemos, são estudos envolvendo uma cartela grande com todas as cores. Mas estudar como cada cor se comporta em relação a outra cor pode nos trazer surpresas e acelerar nosso aprendizado, aliás, fazer cartelas é um dos melhores exercícios em aquarela desde que o estudo seja amplo. Por exemplo, na foto acima, a mistura do Lemon Yellow com Purple, meio a meio, resulta em um marrom, talvez Siena Natural se quisermos dar um nome. Quem diria, não é? Let's talk a little bit about Watercolor?! Today's photos and video show how to make a painting with just 2 colors of watercolor (and when I say watercolor I could also say gouache) and the result of mixing these 2 colors. 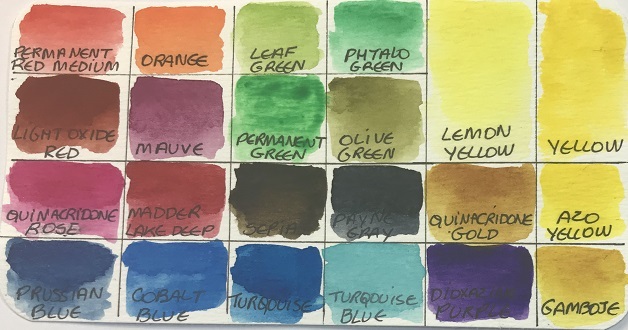 When we buy a box of watercolor we do not always do a detailed study of each color, or when we do, are studies involving a large chart with all colors. But studying how each color behaves in relation to another color can bring us surprises and accelerate our learning, in fact, making charts is one of the best exercises in watercolor since the study is ample. For example, in the picture above, the mixture of Lemon Yellow with Purple, half to half, results in a brown, perhaps Natural Siena if we want to give it a name. Who would have thought so? Essa cartela é composta por 5 quadrados horizontais e 4 quadrados verticais, mas podem ser 5, 6, 7...quantos quadrados verticais quisermos pois da segunda linha pra baixo os quadrados verticais são aguadas. As cores que escolhi pro nosso exemplo são o Permanent Yellow Deep e o Crimson Lake e elas são pintadas no primeiro e no quinto quadrado da primeira linha da cartela, respectivamente, e umedecidas apenas o suficiente pra pintar, ou seja, queremos que fiquem concentradas no papel. This chart is made up of 5 horizontal squares and 4 vertical squares, but they can be 5, 6, 7 ... as many vertical squares as we want, because from the second squares down the vertical squares are watery colors. The colors I chose for our example are Permanent Yellow Deep and Crimson Lake and they are painted in the first and fifth squares of the first row of the carton, respectively, and moistened just enough to paint, that is, we want them to be focused in the paper. Abaixo de cada uma das cores fazemos suas aguadas, acrescentando 1 ou 2 gotas de água por vez pra ir clareando. O volume de água que acrescentamos na verdade é opcional, eu acrescentei apenas 1 gota mas poderia ter sido 3, 4 gotas. Em seguida misturamos essas 2 cores puras em partes iguais e pintamos o quadrado do meio, o que fica entre elas, ou seja, o terceiro quadrado na primeira linha e assim vemos uma nova cor formada com a mistura de 50% de Permanent Yellow Deep e 50% de Crimson Lake. Também fazemos a aguada dessa nova cor. Below each of the colors we make their watering, adding 1 or 2 drops of water at a time to brighten them. The volume of water we add is actually optional, I added only 1 drop but could have been 3, 4 drops. Then we mix these two pure colors in equal parts and paint the middle square, which is between them, that is, the third square in the first row and thus we see a new color formed with the mixture of 50% of Permanent Yellow Deep and 50% of Crimson Lake. We also water this new color. Então agora temos uma cartela com 3 cores: Permanent Yellow Deep, Crimson Lake e a nova cor que é a mistura das duas. Vamos novamente misturar 2 cores, mas desta vez serão o Permanent Yellow Deep puro com essa nova cor que surgiu e pintar o segundo quadrado da primeira linha, e assim teremos uma quarta cor. Fazemos a aguada dessa quarta cor nos quadrados abaixo dela. So now we have a chart with 3 colors: Permanent Yellow Deep, Crimson Lake and the new color that is the mixture of the two. We will again mix 2 colors, but this time will be the Pure Yellow Permanent with this new color that emerged and paint the second square of the first row, and so we will have a fourth color. We water that fourth color in the squares below it. Agora nossa cartela tem 4 cores e vamos fazer a quinta cor misturando Crimson lake com a cor que fizemos no meio da cartela, ou seja, com a terceira cor da primeira linha, em partes iguais, e obtemos uma quinta cor! Parece confuso, não é? Na verdade é uma cartela bem simples mas precisa ser feita com atenção. Fazemos também as aguadas dessa última cor e assim nossa cartela está completa! Ou seja, tenho uma cartela que inicialmente tinha 2 cores, que resultaram em outras 3 cores e todas as aguadas correspondentes. E nessa cartela fiz apenas 3 linhas de aguadas mas como eu disse no começo do post, poderia fazer 4, 5, 6 ou mais linhas de aguadas. Não podemos chamar as aguadas de "novas cores", talvez de "tons", então veja quantos tons interessantes temos na cartela, e 5 cores no total! Now our card has 4 colors and we will make the fifth color by mixing Crimson lake with the color we made in the middle of the chart, that is, with the third color of the first row, in equal parts, and we get a fifth color! It sounds confusing, doesn't it? In fact it is a very simple chart but it needs to be done with attention. We also make the watery of this last color and so our chart is complete! That is, I have a chart that initially had 2 colors, which resulted in another 3 colors and all the matching watery. And in this chart I made only 3 watery rows, but as I said at the beginning of the post, I could do 4, 5, 6 or more watery colors. We can not call the watery colors "new colors", maybe "tones", so see how many interesting tones we have in the chart, and 5 colors in total! Podemos fazer isso com todas as cores que temos, será um excelente estudo, e as cartelas são fontes de consulta quando precisarmos. As possibilidades são muitas, imagine fazer isso com uma caixa de aquarela, com 12 cores, quantas novas cores teremos? Quantas aguadas? Um mundo de cores se abre diante de nós! We can do this with all the colors we have, it will be an excellent study, and the charts are sources of consultation when we need them. The possibilities are many, imagine doing this with a watercolor box with 12 colors, how many new colors will we have? How many watery colors? A world of colors opens before us! Sei que é mais fácil comprar uma caixa de aquarela com 24, 48, 72 cores e pegar a cor diretamente e pronto......... é uma opção. Mas pra quem realmente quer aprender o ideal é limitar as cores numa pintura. Por exemplo, se temos uma caixa com 12 cores dificilmente usaremos as 12 cores em uma única pintura, normalmente usamos 4 ou 5 porque o que também enriquece uma pintura é a mistura das cores que o artista fez; é uma mistura única, e esse limite de cores unifica a pintura e as cores "conversam" entre si porque uma cor tem parte da outra. Quando vejo uma pintura com várias cores, sinceramente, a impressão que tenho é que as cores estão aos tapas umas com as outras disputando quem aparece mais. E sabe qual cor aparece mais? Nenhuma, porque é confuso pro olho humano aquela misturada toda! Cientificamente falando, o olho humano percebe bem de 3 a 5 ou até 6 tons de uma mesma cor, mais do que isso torna-se confuso, aborrecido, monótono de olhar. E feio na maioria das vezes. Vejo esse problema acontecer bastante com pessoas que pintam livros com lápis de cor; quando a pintura acaba a gente não sabe pra onde olhar, as cores não combinam, são muitas, tudo é muito parecido, nada se destaca. Claro que existem trabalhos monocromáticos, ou seja, uma cor e seus tons são usados. Ás vezes também escolhemos cores muito parecidas, por exemplo, cores de Outono que são ocres, amarelos queimados, terras...com pitadas de vermelhos e verdes, mas isso é outra história, as cores foram escolhidas assim pra obedecer a uma temática. Seja como for, é muito bom saber o que fazer com o pincel: que cores escolher, quem combina, quem "briga" com quem. O mundo das cores é imenso e entender um pouquinho dele nos dá mais segurança ao pintar. I know it is easier to buy a box of watercolor with 24, 48, 72 colors and get the color directly and ready ......... it is an option. But for those who really want to learn the ideal is to limit the colors in a painting. For example, if we have a box with 12 colors we will hardly use the 12 colors in a single painting, we usually use 4 or 5 because what also enriches a painting is the mixture of colors that the artist does; a unique blend, and this color boundary unifies the paint and the colors "talk" to each other because one color has part of the other. When I see a painting with several colors, honestly, the impression I have is that the colors are fighting each other disputing who appears more. And do you know which color appears the most? None, because it is confusing to the human eye that all mixed up! Scientifically speaking, the human eye perceives well 3 to 5 or even 6 shades of the same color, more than that it becomes confused, boring, monotonous to look at. It's ugly most of the time. I see this problem happen a lot with people who paint books with colored pencils; when the painting ends we do not know where to look, the colors do not match, they are many, everything is very similar, nothing stands out. Of course there are monochrome works, that is, a color and its tones are used. Sometimes we also choose very similar colors, for example, autumn colors that are ocher, burnt yellow, earth ... with red and green bugs, but this is another story, the colors were chosen like this to obey a theme. In any case, it is very good to know what to do with the brush: what colors to choose, who combines, who "fights" with whom. The world of colors is immense and understanding a little of it gives us more safety when painting.